Cook Time: 1 hr. 20 min. Fiber-rich barley, instead of lettuce, is the base for this salad that combines the mellow flavor of roasted red onion with hearty shiitake mushrooms. For vinaigrette, whisk together vinegar, honey and mustard. Slowly add oil while whisking, until emulsified. Add salt and pepper to taste. Preheat oven to 350° F. Peel onion half and coat with oil. Place on baking sheet and roast until tender, about 30 minutes. Chop coarsely. In a medium pot, bring broth to a boil and add barley. Reduce heat and simmer, covered, until barley is tender (35 to 40 minutes). Drain any excess liquid; spread barley on a baking sheet to cool. In a sauté pan over medium heat, cook mushrooms with 1 tablespoon of oil until tender. 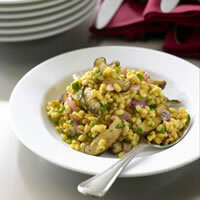 Mix sautéed mushrooms into cooled barley, along with onion, parsley, salt and vinaigrette. Adjust seasoning as desired.